Thankyou blog follower Ju. Recently Ju connected me with a woman with a husband who has a Private Pilot’s Licence. Once I made contact, Michelle and Dave were delighted to fly me in their four seater plane, a Cirrus SR20 which Michelle referred to as the BMW of the skies. Today we flew. Not a cloud in the sky. Clean blue sky. Hardly a breeze. The landscape rich and varied. The Derwent River sparkled from start to finish. The experience was stunningly magnificent. I love words but I find it difficult to express my excitement, my pleasure, and the sheer joy of the flight in the depth which I felt. There below me was the river I have come to love and know a little more. There below me were the tracks, paths, roads and landscape over which I have walked – and I laughed occasionally remembering certain experiences during my walks. There below me were logging tracks, dam roads, and fading vehicular pathways. And then we were flying over impenetrable sections which may not be walkable. 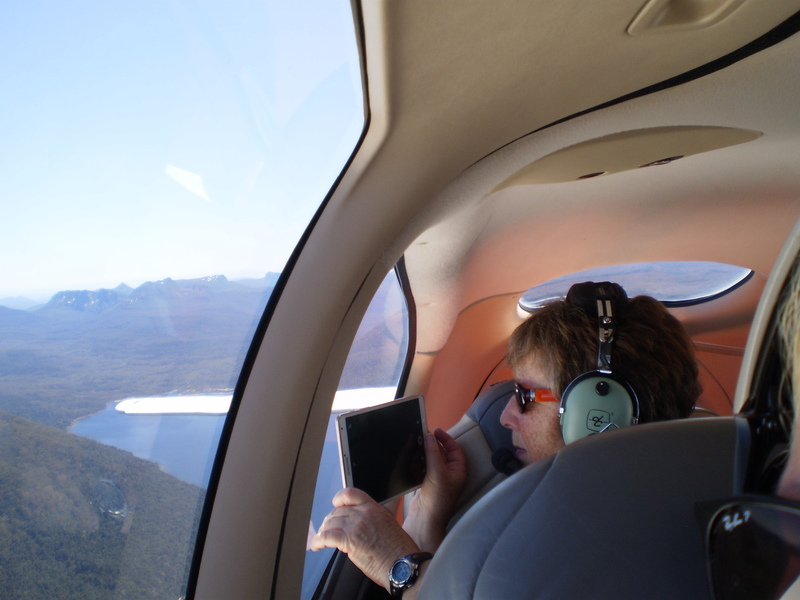 We left Hobart airport and flew to Storm Bay by rounding the Iron Pot, then we followed the river upstream to the source. Dave flew on until we reached the northern most point of Lake St Clair. The return journey was equally as beautiful and engaging. The light had changed presenting us with a ‘new’ landscape. Of the hundreds of photos taken by Michelle, friend Chantale and myself, I include a tiny selection here. The photo above taken by Michelle caught me totally preoccupied by the view. MIchelle’s photo above shows the Derwent River snaking around the Claremont Golf course with Cadbury’s Chocolate Manufacturing buildings in white to the left. 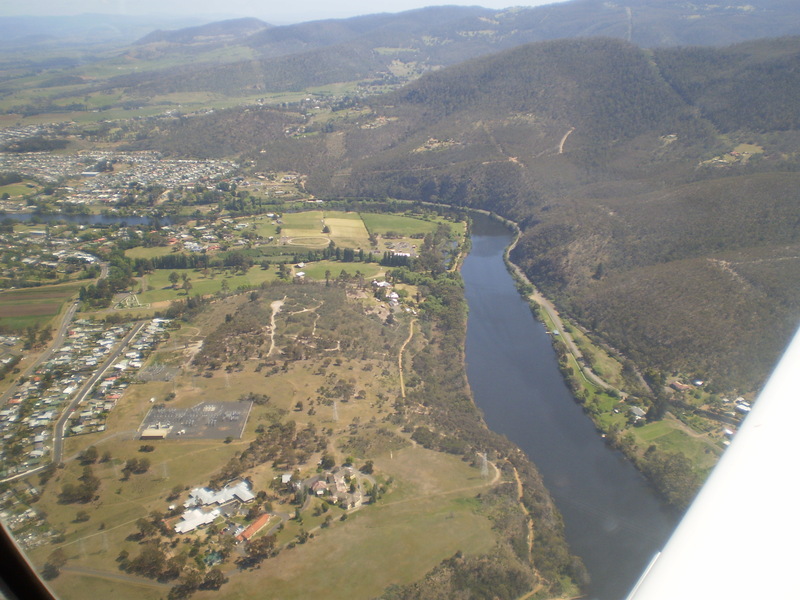 The photo above shows a straight section of the Derwent River before the township of New Norfolk on the upper left. The photo above shows the Derwent River circling part of Reid’s cherry orchards. 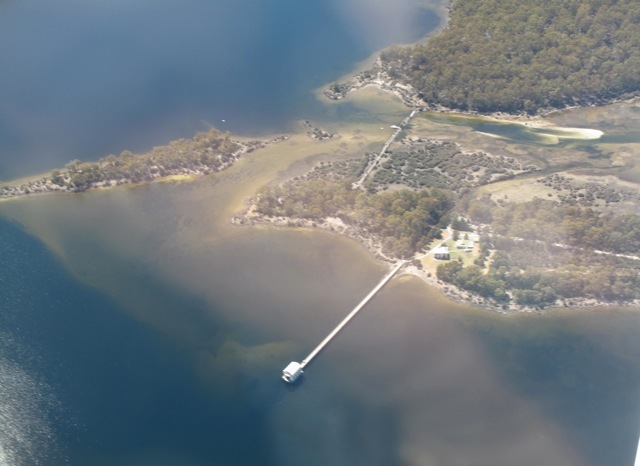 Chantale’s photo of the Pumphouse Point accommodation projecting into Lake St Clair, also shows the dam across the Derwent Basin where the water enters St Clair Lagoon. The source of the Derwent River starts to the right of the photo. 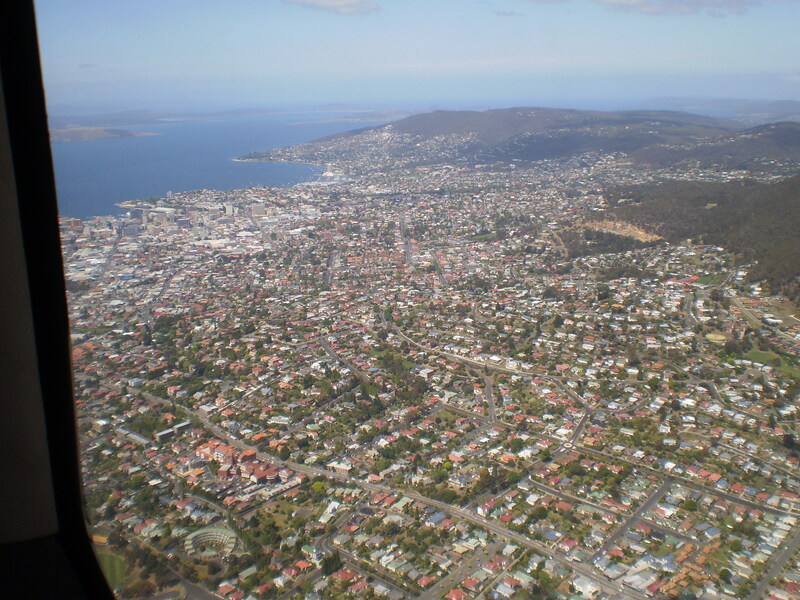 Michelle’s photo above shows part of sprawling Hobart set against the Derwent Harbour. Those photos taken while flying over the river westwards of Gretna will be incorporated into the stories of my walks from Gretna onwards, in future posts. From now on, you can expect both ground-based and aerial photos to enrich the stories. 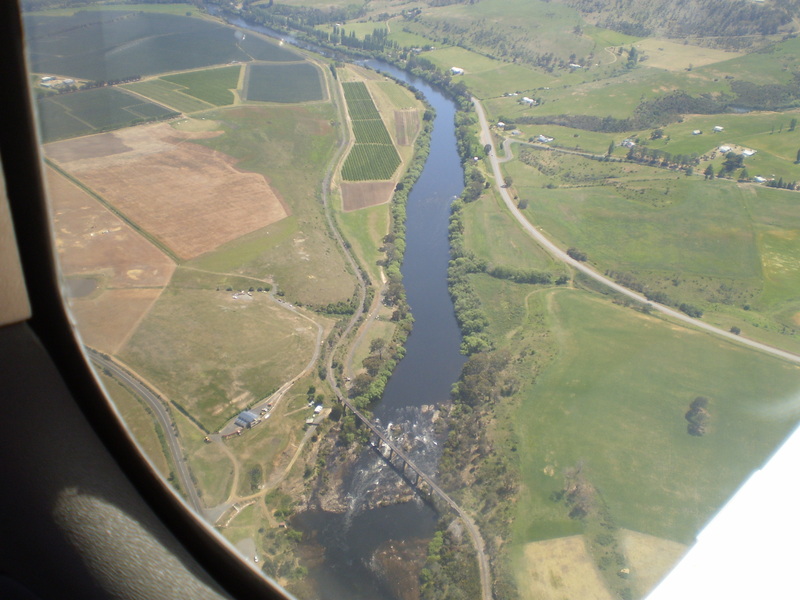 I feel like the luckiest person in the world for the opportunity to travel in a smooth flying small plane, to see the Derwent River winding through the landscape in glorious blueness, and to be reminded Tasmania is a superb place. A truly wonderful and memorable day. Thankyou to all concerned. 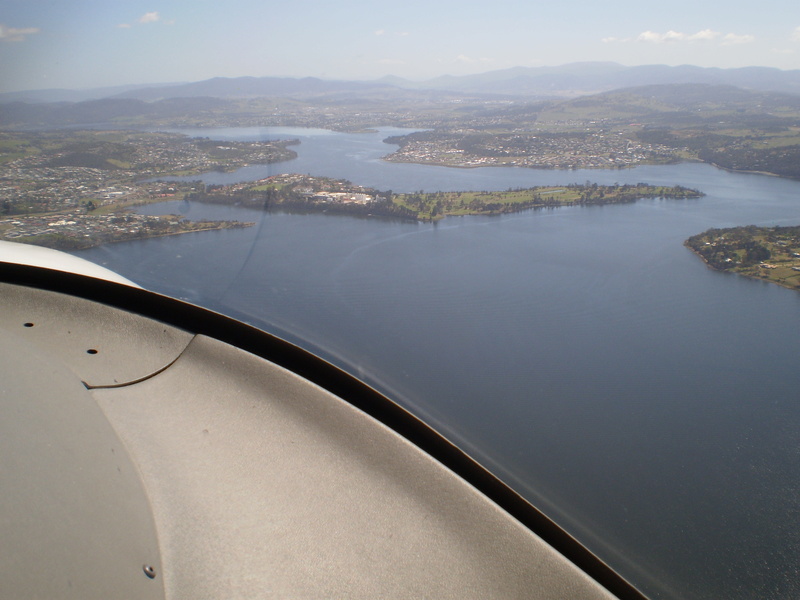 This entry was posted in Derwent River, Hobart, Tasmania, Walking and tagged Cadbury’s Chocolate Manufacturing, cherry, Cirrus SR 20, Claremont Golf Course, Derwent Basin, Derwent Harbour, Derwent River, flying, Gretna, Hobart, Iron Pot, Lake St Clair, New Norfolk, photos, plane, Private Pilots License, Pumphouse Point, Reids, St Clair Lagoon, Storm Bay, Tasmania, walking on October 28, 2015 by Tasmanian traveller. How awesome. There are still some wonderful human beings in the world. Exactly my sentiments. And it can be right on your own doorstep. We were so lucky in every way. Who needs to win the lottery of dollars when you can have this! Yes people are fantastic. Every time I do something I am reminded that there are lots of good people out there. You will be surprised but I did and the memory was stronger as I typed the post. What a wonderful experience and on such a beautiful day. We were walking on Hope Beach yesterday and noticed a plane fly over around Iron Pot Lighthouse. Perhaps that was you off on this aerial adventure. It is such a lovely view, seeing a favourite place from above, giving a new perspective on familiar ground. I look forward to future aerial photos in your posts. We were flying past Hope Beach around 11.10ish … I think. Was it you?